There’s a lot of speculation that Robin van Persie may be dropped for Manchester United’s game against Hull today. The flying Dutchman – scorer of that sensational header at the World Cup – has returned to earth with a bit of a bump this season. His form has been indifferent at best and he has just three goals to his name in this campaign. It’s all a bit surprising given that it looked as though he would be one of the obvious beneficiaries of Van Gaal’s arrival and he now has players such as Di Maria creating chances. In the game against his old club Arsenal last weekend, Van Persie only touched the ball 13 times and two of those touches were corners (I’m always suspicious of centre-forwards who take corners, it just doesn’t seem right to me somehow). His performance was described by his manager as “very bad” and my Manchester United supporting brother has been using similar but stronger terms to describe his performances all season. I’ve never entirely bought into the hype surrounding Van Persie. He’s a very good footballer and a fine finisher on his day but he’s always had a tendency to fade out of games and I’ve never felt as though he’s had the overall influence on his sides that you would expect from a player of his quality. 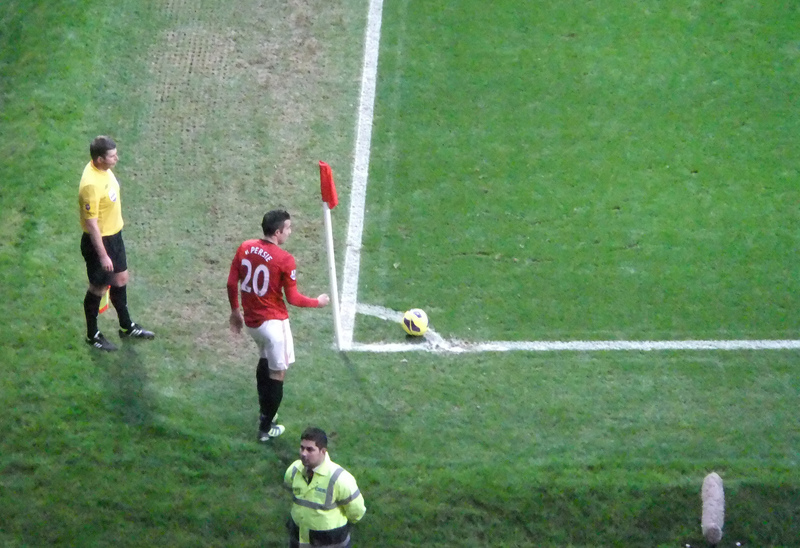 He often seems isolated on the pitch. Both his parents are artists but he conceded in an interview with the Daily Mail a few years ago that he doesn’t see things the way they do. “They can look at a tree and see something amazing, whereas I just see a tree,” said Van Persie. Indeed, we’ve all had that issue from time to time Robin. Later in the same interview he said: “When I look at a football pitch I suppose, yes, I see it as my canvas. I see solutions, possibilities, the space to express myself.” It would appear that those solutions and possibilities are becoming harder to see, the blank canvas a more intimidating prospect these days for the Dutch master. Van Gaal suggests that “for Robin, it is a question of confidence” and that’s likely to be the case for any striker who’s not scoring many goals, especially one playing in a team with so much attacking potential. It would be folly to write Van Perise off but I suspect that we’ve already seen the best of him. At Arsenal he was a big fish in what was an increasingly shrinking pond and while his first season at Old Trafford was excellent, the rest of the league performed exceptionally poorly for that Manchester United squad to win the title so comfortably. If Manchester United put him up for sale, I wonder how much anyone would pay for him now? This entry was tagged Arsenal, football blog, Manchester United, Manchester United v Hull, Van Gaal, Van Persie. Bookmark the permalink.